Yes, a next book with Mail-Interviews got published. This time a combination of complete mail-interviews and a collection of unfinished interviews. 21 mail-artists in total. 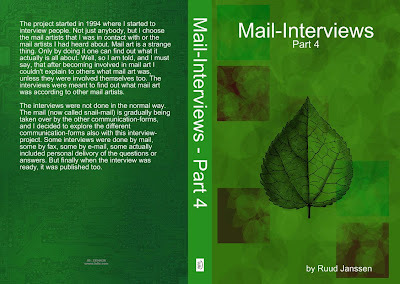 A selection of 21 more Mail-Interviews conducted by Ruud Janssen with International Mail-Artists and Fluxus-Artists in the years 1994 till 2002. This time also unfinished interviews! Includes interviews with H.R. Fricker, Julia Tant, Raphael Nadolny, John Evans, Bern Porter, Birger Jesch, Patricia Collins, Daniel Plunkett, Patricia tavenner, Judith A. Hoffberg, Peter Küstermann, Robert Rocola, Rod Summers, Marie Stillkind, Roy Arenalla, Rudi Rubberoid, Stephen Perkins, Klaus Groh, Ruggero Maggi, Vittore Baroni, Svjetlana Mimica and a reprint of the mail-interview Newsletter that explains the Mail-Interview Project. Because I know some people don't want to order online I will see how I can help there. When I order the books myself and send them out, postage is paid twice. Cheapest way is to order straight from LuLu. But when I have stock here in Breda I can determine how heavy a package is and what the extra postage is. Next month I will give the details.